Artesia residents will need to prepare for yet another bout of major road construction on one of Artesia’s most active streets: 13th Street, from just north of Main Street to just south of Hermosa Drive. Smith Engineering and AUI Inc. will begin a five-phase project today, weather permitting, which will be the start of an anticipated 20-month-long major overhaul on the road, traffic signals, sidewalks, sewer lines, water lines, drop inlets and storm drains. Smith Engineering is the same engineering firm that completed similar construction on 13th in 2013 and 2014. The first phase will consist of renovating from just south of Grand Avenue, near the businesses Primerica Financial Services and World Finance Corporation, to the alleyway behind Terry’s Electronics, located on the corner of Main and 13th streets. This section of 13th Street will be completely closed; however, all businesses located in the vicinity will be accessible from the side streets and alleys. Grand will also be completely closed at 13th Street. This phase will last approximately five months. The second phase will stretch from the alleyway behind Terry’s Electronics to 200 feet north of Main Street. The intersection of 13th and Main streets will be replaced with concrete as opposed to asphalt due to the heavy traffic flow the crossroads receive on a daily basis. This phase is planned to last 90 days. The third phase will start at Primerica Financial Services and will extend to Ray Avenue. This phase will last approximately five months. Phase four will start just north of Ray Avenue and will end just south of Clayton Avenue. This phase will last five months. The fifth and last phase will extend from Clayton Avenue to an alleyway just south of Hermosa Drive. This phase will last another five months. 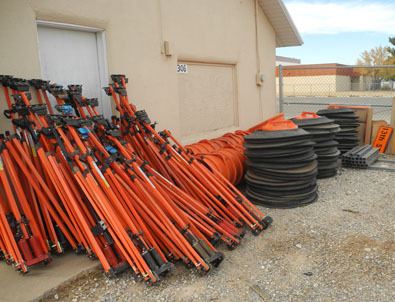 The road construction will have a vast impact on the traffic on and around the Artesia High School campus. Traffic will be redirected to use Seventh Street going east and 20th street if going west. According to Thad Phipps, assistant superintendent of operations for the Artesia Public Schools, APS, the engineering firm, the contractors and the city worked together to establish detours to decrease community traffic on the campus. Drivers are urged to pay close attention to construction signs, detour signs and business access signs, as well as use Seventh and 20th Streets to navigate around the construction project. Smith Engineering will also be updating a Facebook page called “13th St Project-City of Artesia, NM” where they will inform followers about the project and how it’s coming along.